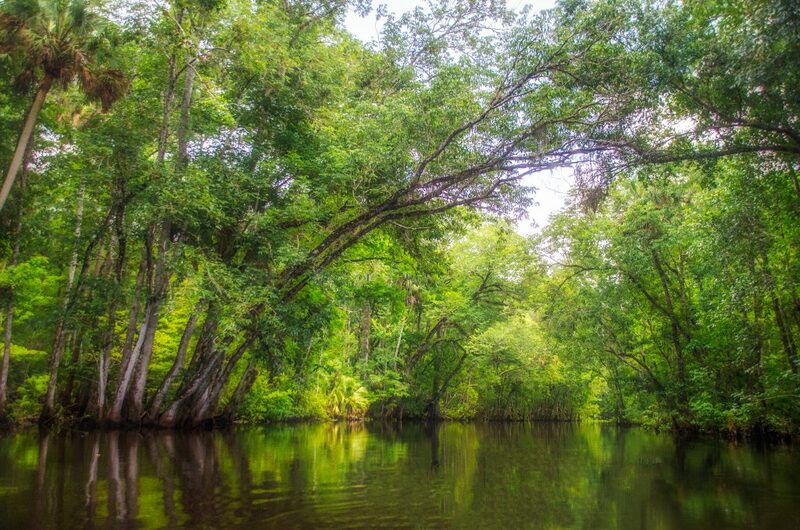 The Ocklawaha River is the principal tributary of the St. Johns River. 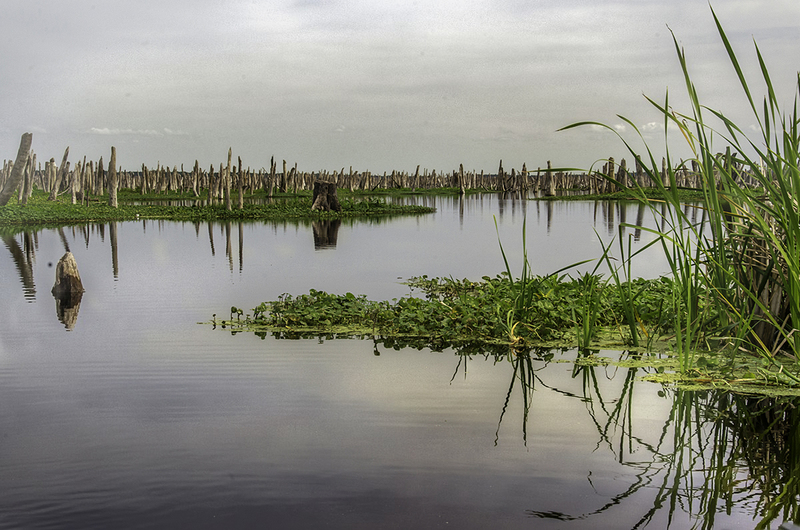 It’s main source is Lake Griffin, part of the Harris chain of lakes in Lake County, Florida. 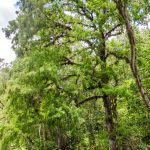 The Ocklawaha River watershed includes parts of the Green Swamp, most of Lake County, and portions of Marion, Alachua and Putnam counties. 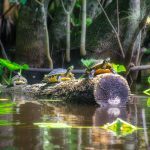 The key tributary to the Ocklawaha is the Silver River, which originates in Silver Springs, Fl. During the 1800’s and early 1900’s, steamboats populated the winding river, bringing folks from Palatka to Silver Springs. These boats were small and narrow in order to navigate the many twisting turns. The Hart Line was the most popular, as was Lucas Line as well. 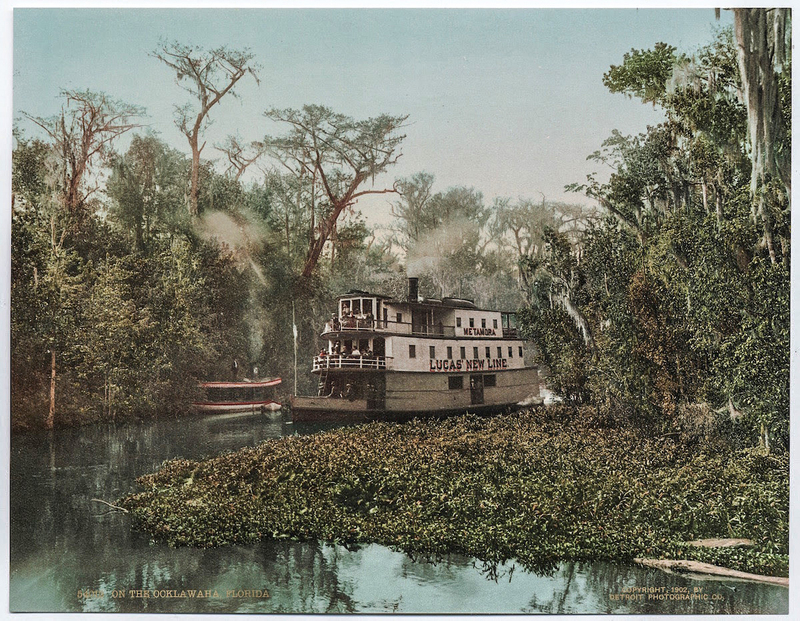 With the arrival of the railroad to Ocala, Florida the steamboat popularity declined. On many of today’s maps several of the landings where the steamboats picked up passengers are still listed. 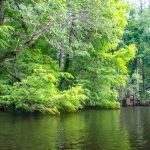 Marjorie Harris Carr, past president of Florida Defenders of the Environment played a key role in fighting against the continuing of The Florida Barge Canal through the Ocklawaha River. In January of 1971 a federal judge issued an injunction that stopped construction of the canal. This was immediately followed by President Richard Nixon officially halting construction due to the environmental damage it would cause. Today the Rodman Dam, now the Kirkpatrick Dam, is a reminder of the fight that continues to this day to have the dam removed. 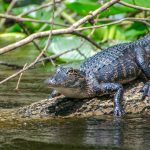 The fight to save the Ocklawaha River has inspired many artists, poets and musicians over the years to include Will McLean, Gamble Rogers, Don Grooms and Whitey Markle. 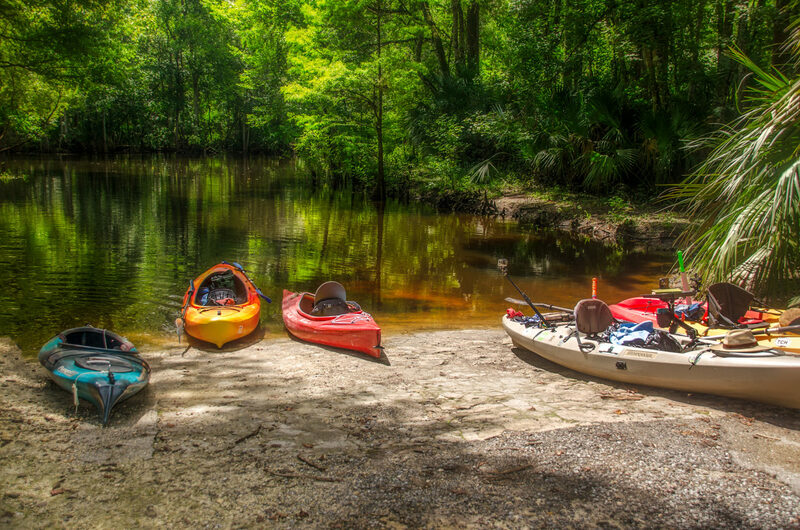 The 74 mile Ocklawaha River is a must paddle for those interested in ‘Old Florida’. 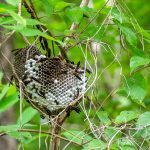 It’s history is rich as are the wildlife and surrounding forests. One of the most popular and uninhabited sections of the river is from Gores Landing to CR 316, see map below. 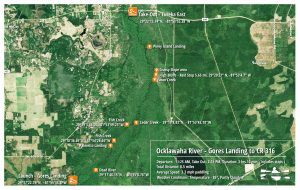 Location: This section of the Ocklawaha River is located between NE 98th St. South of Fort McCoy on CR 315 and CR 316 East of Fort McCoy in Marion County. 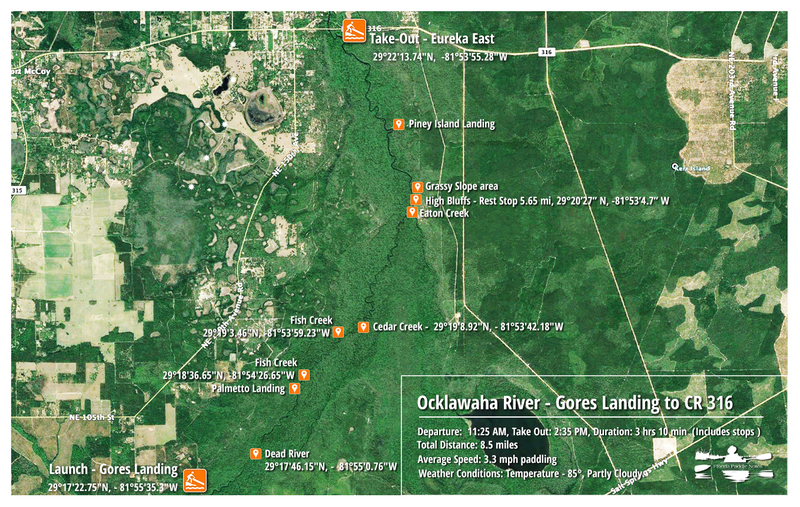 Launch point: The launch is located at Gores Landing on 13750 NE 98th St. South of Fort McCoy on CR 315. See above map. There is a $5.00 fee per vehicle. Take-Out point: The take-out is located at Eureka East on CR 316. River right just before the bridge over the river. There is another take-out just under a half mile after the bridge, Eureka West on River left. Difficulty: Easy. There are occasional logs that need to be paddled over but it is not difficult. Average Paddle Time: This paddle can take as much as 4-5 hours to complete. With a swift current and high water it took us just over 3 hours including a break. Width and Depth: The river is pretty consistent in this section with an average width of 100′ give or take. Checking the water level gauges in two places showed and average depth at the gauges to be around 5′. 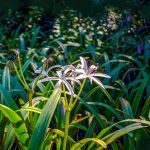 Current – Tidal: Spring fed. Due to the abundant rain this year, the river was flowing very quickly for the first 6 miles and slowed during the last 2. Side Paddles: There are several side creeks to explore depending on the water level and if fallen trees have been cut to allow passage. Dead River is about a mile up, river right, after launching from Gores Landing. Just under the 2 1/5 mile mark is the southern end to Fish Creek on river left, with the north end of the creek also at river left 3/4 mile further. 3 1/2 miles into the paddle Cedar Creek is on river right and just under 6 miles id Eaton Creek, also on river right. Rest Areas: At the 6 mile mark, more or less, are high bluffs on river right that offer spots to exit and rest. 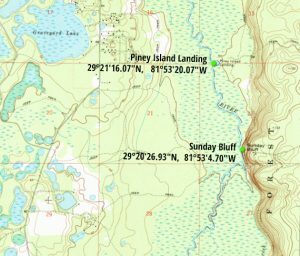 Further on at mile 7, is Piney Island Landing, usually a great place to stop, swim and have lunch. Due to high water, on today’s paddle, Piney Island Landing was all under water! 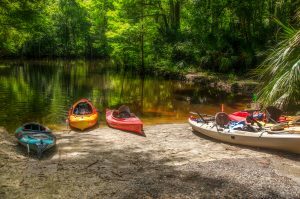 This section of the Ocklawaha River is definitely the most popular. There are no signs of civilization the entire route! On arriving at Gores Landing the swift current was immediately noticeable, we looked forward to a fun paddle. Having had consistent rains this spring, the water level was higher than I have seen in a long time. Based on the 2 gauges I read it was around 5′ deep and in the main channel a little deeper. 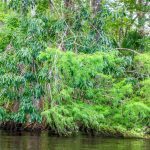 We proceeded north, bordered by Carolina Ash, Bald Cypress, Swamp Tupelo, Red Maples and the characteristic Sabal Palmettos. 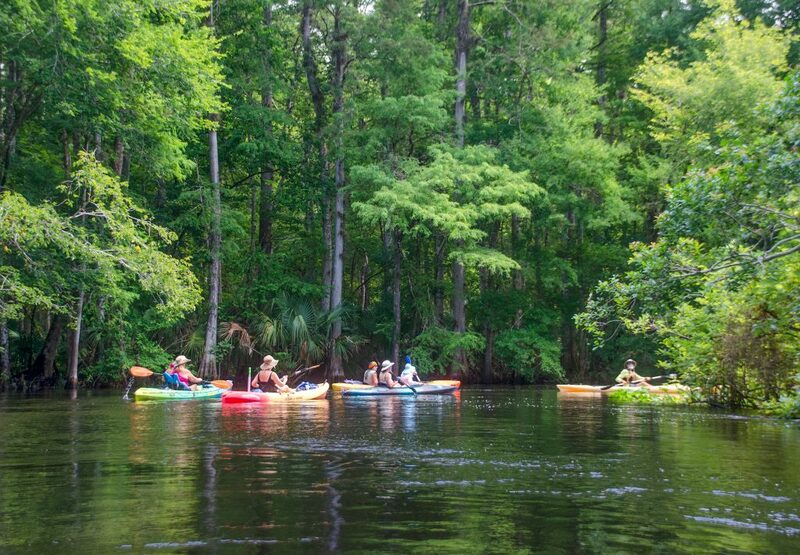 Paddling the Ocklawaha is an exercise in chillin’ out. 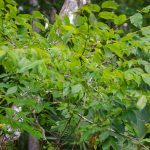 A nice current, excellent wildlife and vegetation. 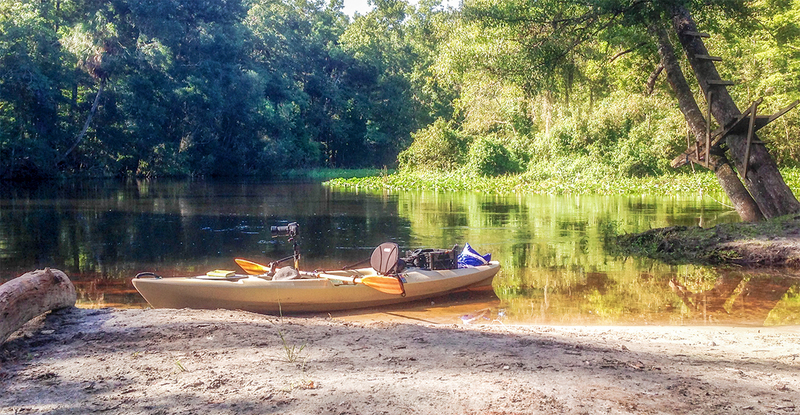 This river always produces gators to observe and there were no shortage on this paddle. 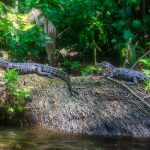 This time however all the gators seen were young, and small, about 3-4 feet long. Several of them just watched as we paddled by, another was a little more vocal, letting out a mild hiss, his/her mouth looked like a smile. Only an occasional egret or small heron was seen today, the river was quiet. We paddled and drifted about 3.5 mph with the current, past clumps of water lilies, water hyacinth and water lettuce. 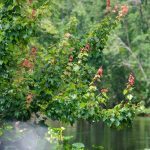 Further inside the shoreline the Pickerel Weed and Button Bush filled in any gaps, accented by the blossoms of the Scarlet Rose Mallow. This is a moment of being in the here and now…no deadlines or appointments to meet. It was a great change from the normal 90’s to the mid 80’s today with partly cloudy skies. It still felt warm on occasion but our trusty water blasters helped cool us off. Just under the 6 mile mark on the river, Eaton Creek is river right. Here, just a few hundred feet further, the easterly banks are high and called the Sunday Bluff. It is a good place to rest and stretch before the final 2 miles. The water is cool and refreshing and the bottom has a slight give before solid sand. One mile further, at the 7 mile mark is Piney Island Landing. This is also a great place to stop on the river. 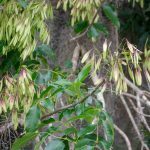 Usually there is a large sandy beach to sit and swim as well as a rope to swing into the river. On this paddle however, due to the high water, Piney Island is basically all under water! The last mile or so went by quickly and we reached our take-out point at 8.5 miles. The take-out is located at Eureka East on CR 316, river right just before the bridge crosses the river. 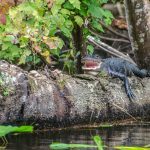 One of my best paddles along the Ocklawaha! 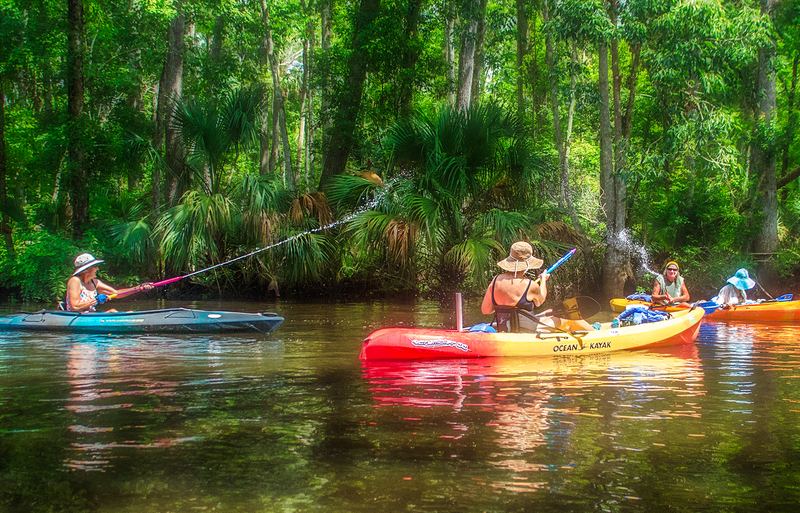 This closes another chapter of Florida Paddle Notes until next time! Love the article you wrote about the Ocklawaha paddle. I can’t wait to paddle that section one day. Thank you Janice. You will not be disappointed on this paddle! This was a beautiful trip. 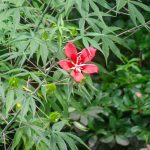 I’ve never seen so many Scarlett Rose Mallows in bloom on one stretch of river!